Jules Feiffer thinks about art, shouldn’t you too? 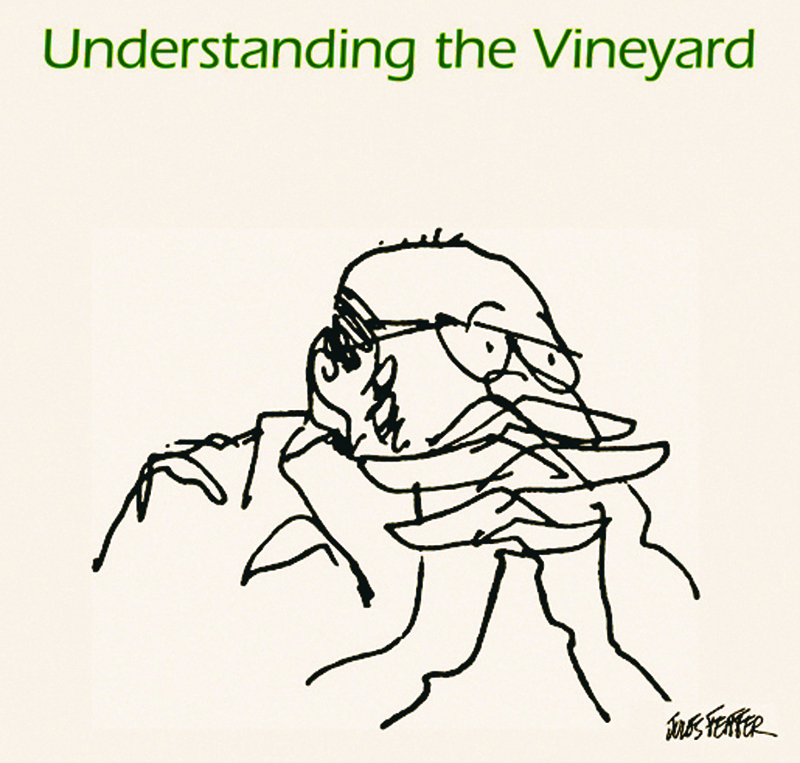 All around the Island this summer, at banks, at libraries, at the museum, at the Polly Hill Arboretum, at the offices of nonprofits and realtors, and at Morning Glory Farm, the pensive self-portrait of New Yorker cartoonist Jules Feiffer has been inviting us to understand the Vineyard. What the mysterious booklet asks us to understand is that the unique character, ecosystem and population of the Vineyard is under constant threat from overdevelopment, underemployment and cutbacks. Martha’s Vineyard Donors Collaborative executive director Peter Temple compiled the booklet using information from the Martha’s Vineyard Commission’s Island Plan, and he hopes that it gives even day-trippers to the Island a sense of the behind-the-scenes work required to keep the Vineyard the Vineyard. “We wanted to help seasonal residents see the big picture of what’s going on here and to see overall what’s needed to sustain the Vineyard,” he said. One of the challenges to see this work was to take all these interesting facts and turn them into something people are really going to read. To make a compilation of statistics about the creeping, deleterious specter of overdevelopment interesting to a general audience, Mr. Temple enlisted the talents of artists and Islanders such as Mr. Feiffer, Hugh Phear and Martha’s Vineyard Public Charter School teacher and professional cartoonist Paul Karasik to illustrate the guide. One of Mr. Karasik’s cartoons features a pair of tourists thumbing through a guide to endangered species trying to identify the local fauna. “It’s some kind of artist,” one of them says about a landscape painter in the distance. And the booklet has its more serious and somewhat disconcerting side as well. As it enumerates in simple and concise prose, 31 per cent of the Vineyard is open to further development; 13 of the 21 Island coastal ponds are already over their limit for nitrogen loading and risk becoming fetid algal dead zones; and only three per cent of the Island remains as farmland at the same time that economic pressures are making such traditional professions untenable. The front lines of those battles will largely take place within the Island’s non profits, which in turn derive their success from the magnanimity of seasonal residents.